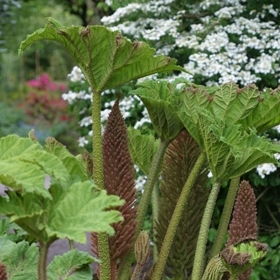 Commonly known as the giant rhubarb – although not related and far less edible is this giant from South America. The South American Indians peel and eat the leaf stalks, but there are probably far better thing to eat and we would advise against it! Here it is grown as an ornamental for its massive leaves which can reach 2 metres (6 feet) across with ease. Its rate of growth is phenomenal in the spring when its inflorescences – which are like massive green cones of flowers burst out of the ground at the same time as the leaves. Not all gunneras are massive however, there are small leaved ones which are cute rowing next to a small pool, including G. magelanica from southern South America. For a more dramatic but in-scale effect you would be better to plant one of the ornamental rhubarbs next to your pond in the smaller garden.